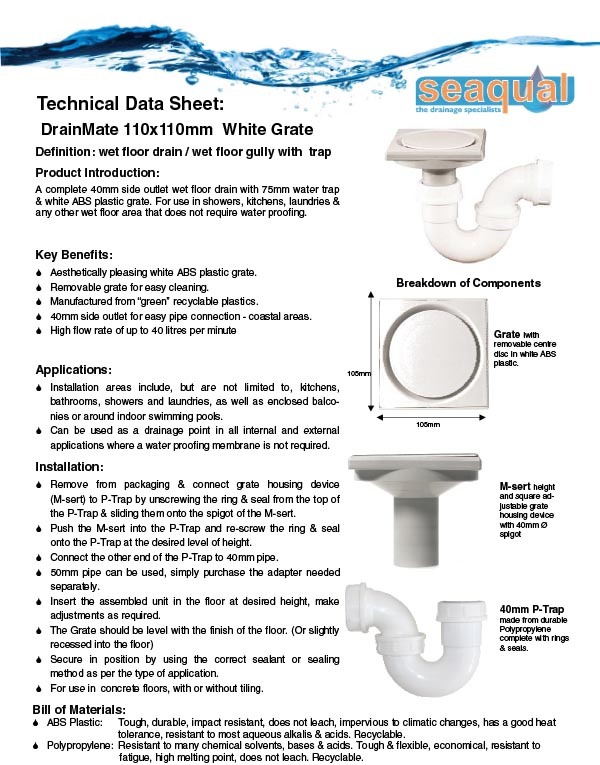 A complete 40mm side outlet wet floor drain with 75mm water trap & white ABS plastic grate. 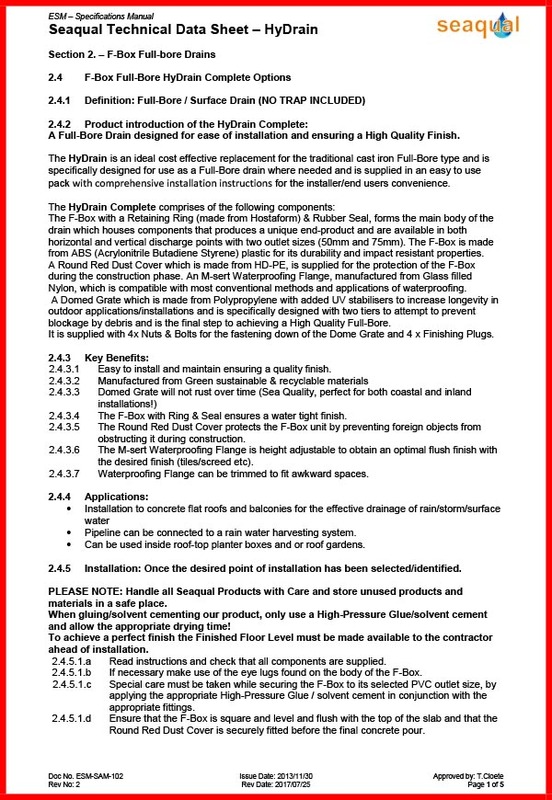 For use in showers, kitchens, laundries & any other wet floor area that does not require waterproofing. 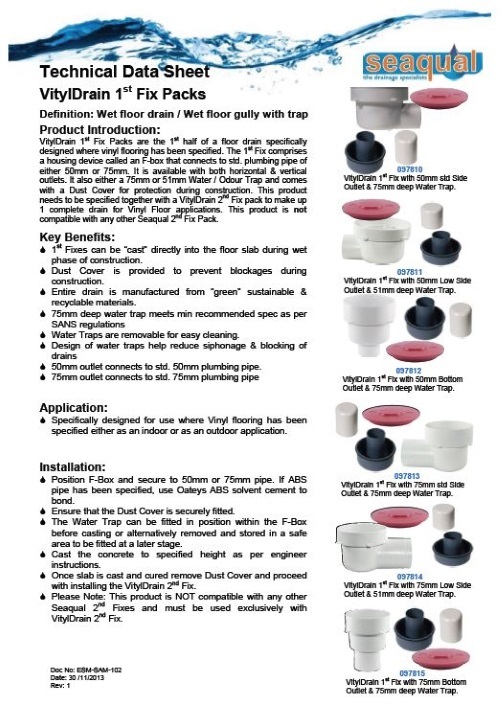 VitylDrain 1st Fix Packs are the 1st half of a floor drain specifically designed where vinyl flooring has been specified. 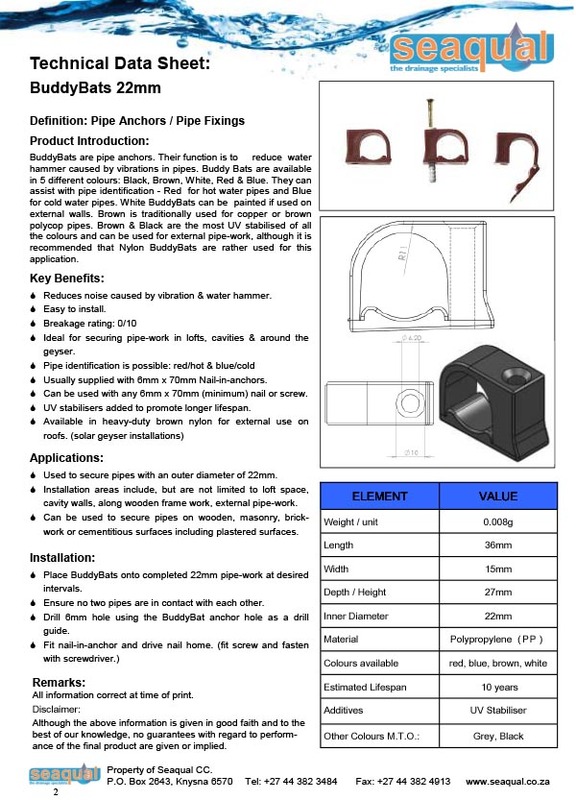 The 1st Fix comprises a housing device called an F-box that connects to a standard plumbing pipe of either 50mm or 75mm. 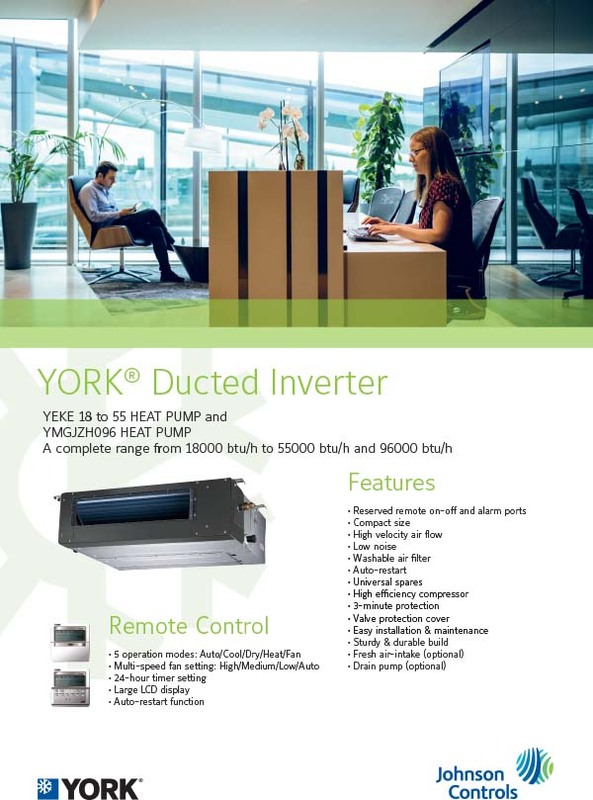 It is available with both horizontal and vertical outlets. 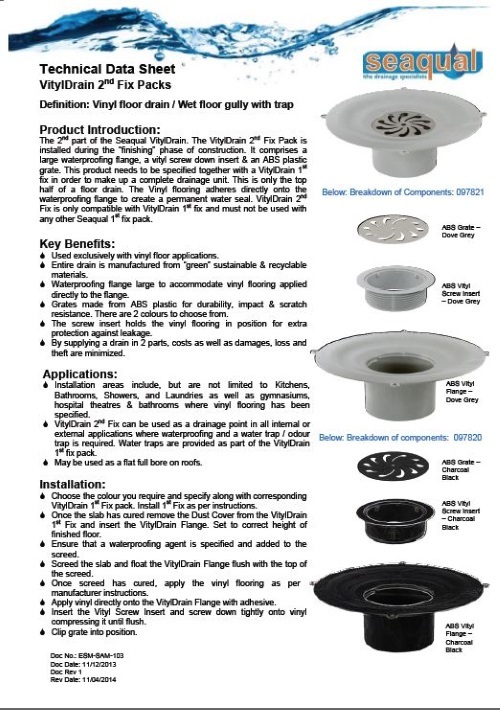 The BalconyDrain Complete comprises of the following components: A F-Box which forms the main body of the drain which houses components that produce a unique end product and are available in both Horizontal and Vertical discharge points with two outlet sizes (50mm and 75mm), is made from ABS (Acrylonitrile Butadiene Styrene) plastic for durability and its impact resistant properties. 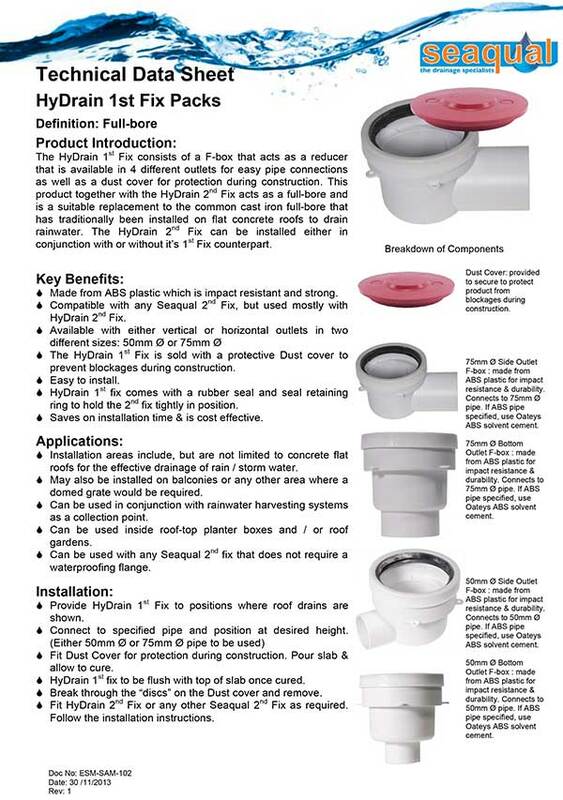 A special Waterproofing Flange which is also made from ABS plastic is compatible with most conventional waterproofing methods. 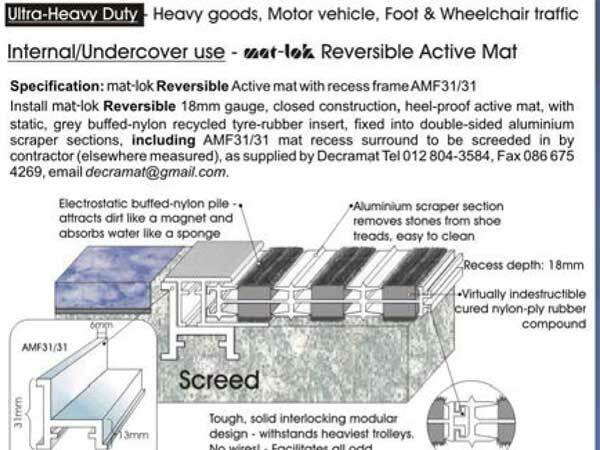 Mat-lok Ultra Heavy duty: unlimited foot, regular shopping trolley and wheelchair traffic. Internal / undercover use and external / ramp use. 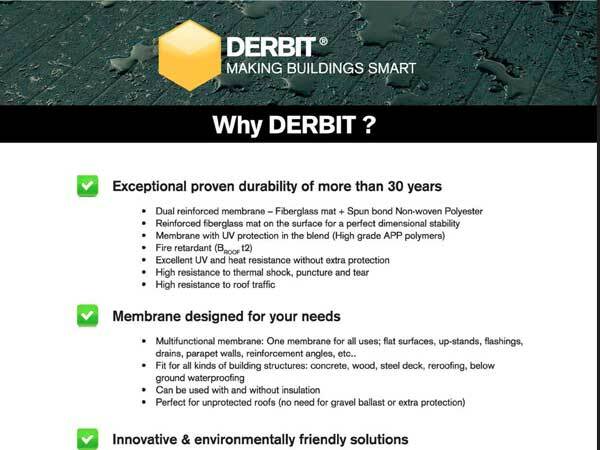 Derbit is a well-respected global group, specialising in waterproofing and energy management. 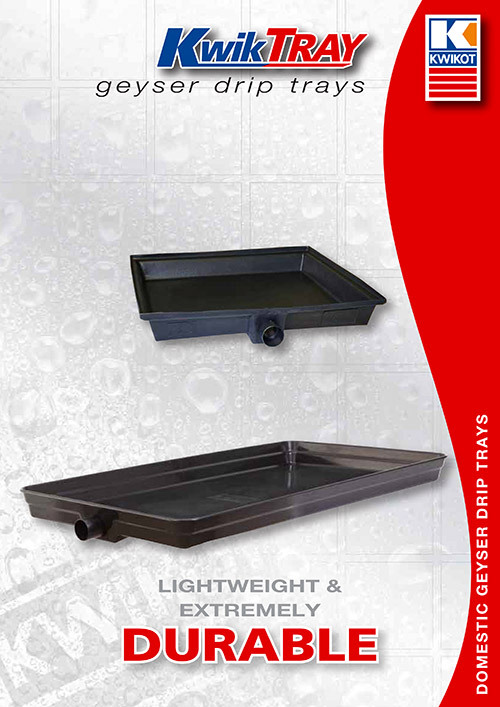 A complete 40mm side outlet wet floor drain with 75mm water trap & 316-grade stainless steel grate with round shaped hole configuration.For use in showers, kitchens, laundries & any other wet floor area which does not require waterproofing. 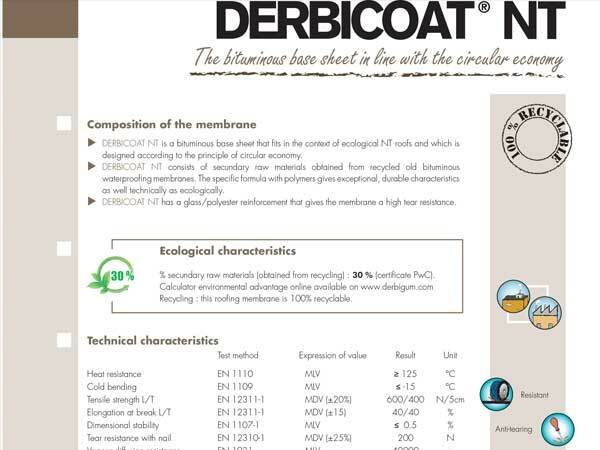 DERBICOAT NT is a bituminous base sheet that fits in the context of ecological NT roofs and which is designed according to the principle of circular economy. 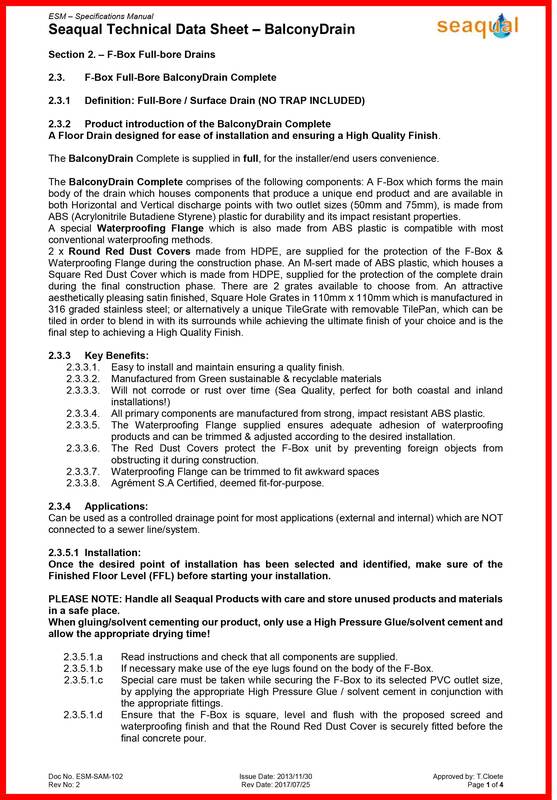 DERBICOAT NT consists of secondary raw materials obtained from recycled old bituminous waterproofing membranes. 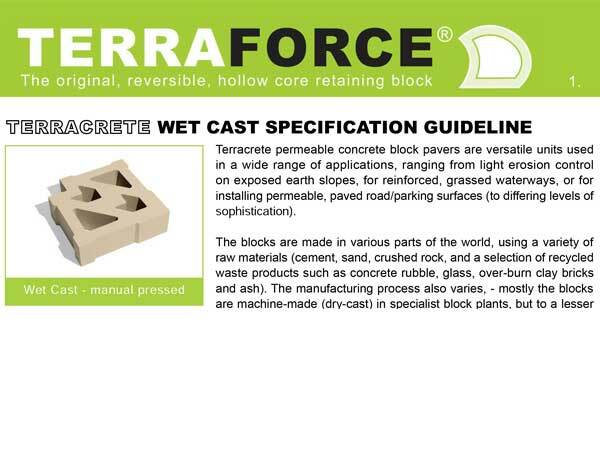 The specific formula with polymers gives exceptional, durable characteristics as well technically as ecologically. 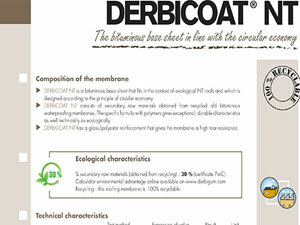 DERBICOAT NT has a glass/polyester reinforcement that gives the membrane a high tear resistance. 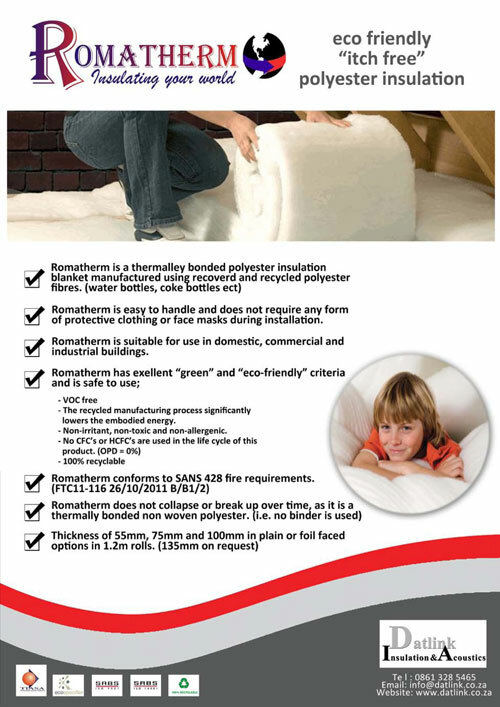 Romatherm is a thermally bonded polyester insulation blanket manufactured using recoverd and recycled polyester fibres (water bottles, coke bottles ect). 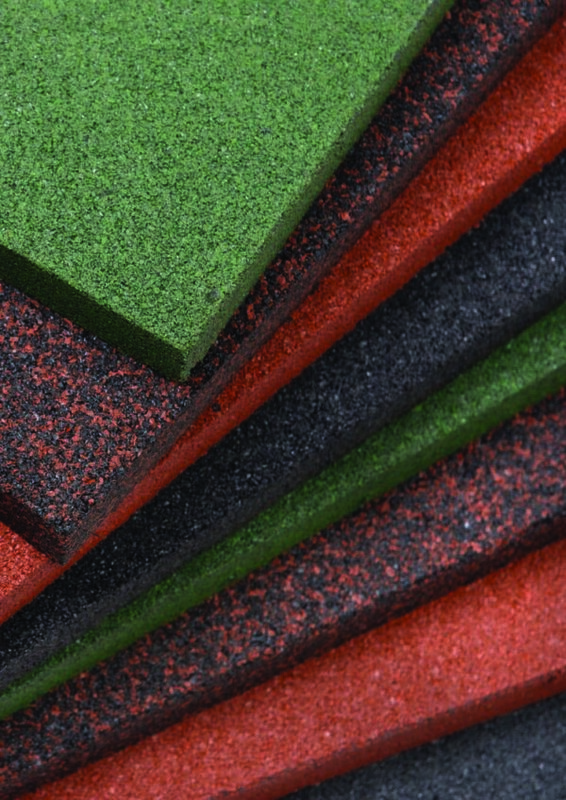 The Maesto Collection tiles are tufted tiles with Enduroback KR4 (modified recucled bitumen) and are made from 100% PFX Stain Shield fibre. 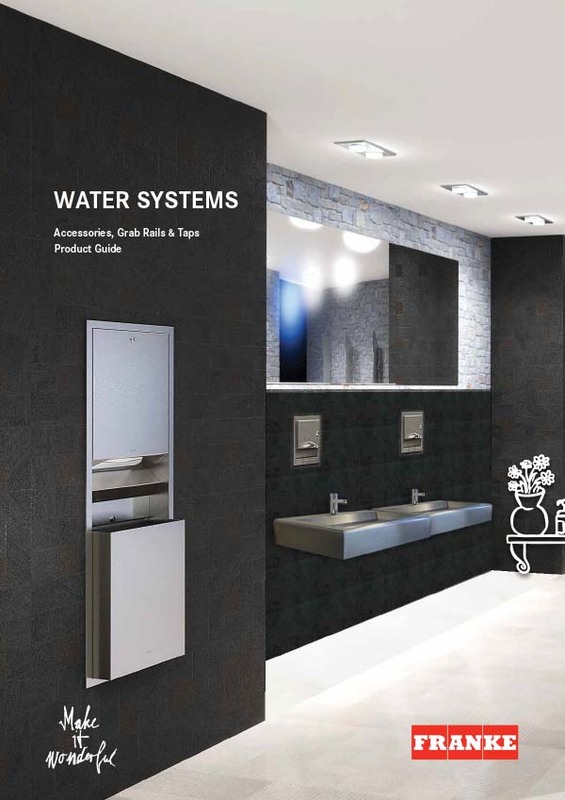 The tiles are designed for medium commercial use. The catchpit that blends into the surrounding paving. 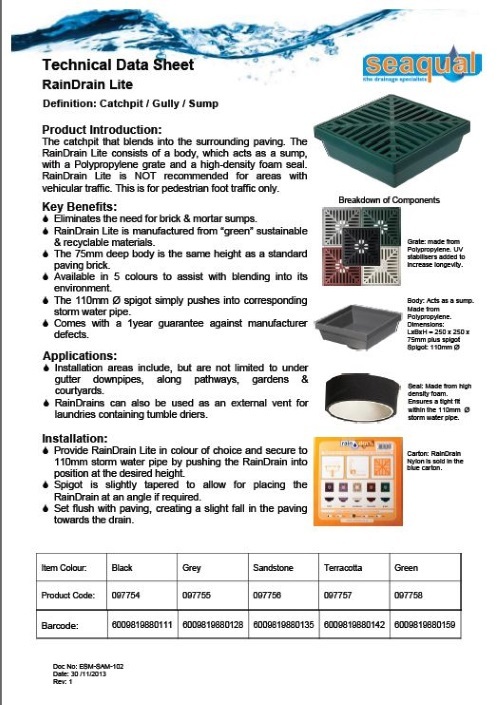 The RainDrain Lite consists of a body, which acts as a sump, with a Polypropylene grate and a high-density foam seal. 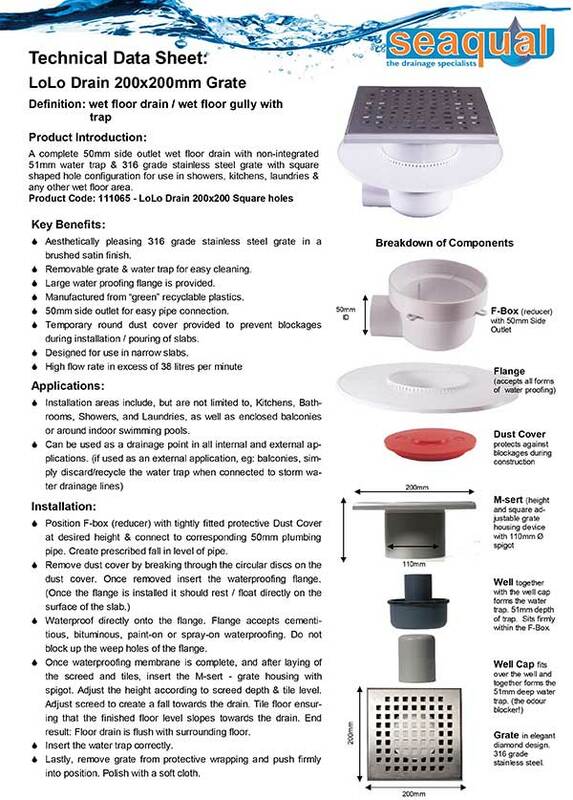 RainDrain Lite is not recommended for areas with vehicular traffic. This is for pedestrian foot traffic only. 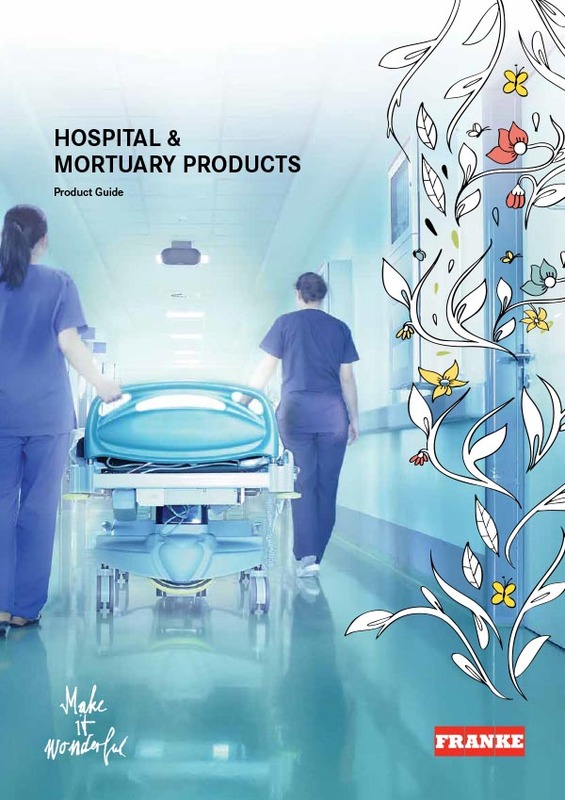 Van Dyck offers a variety of floor coverings and are the manufacturers of soft floor coverings for both residential and commercial markets. 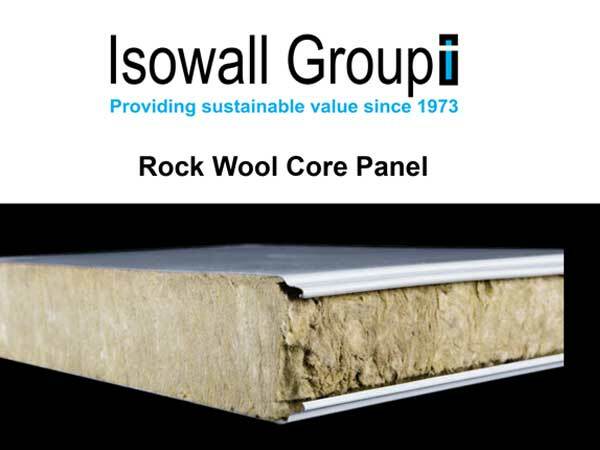 Van Dyck are also manufacturers of rubber underlays (Ecolay/Instalay), rubber pavers/flooring (EnviroBuild) and wall coverings made from 100% post-consumer recycled content (Wall Expressions). 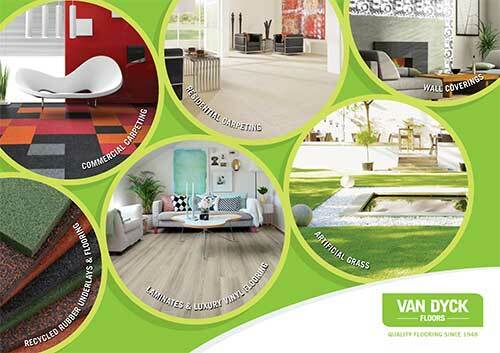 Beyond manufacturing Van Dyck is the exclusive supplier of a comprehensive range of artificial grass (Easigrass), Luxury Vinyl Planks (Rococo/Verso) as well as Laminates (Pergo). 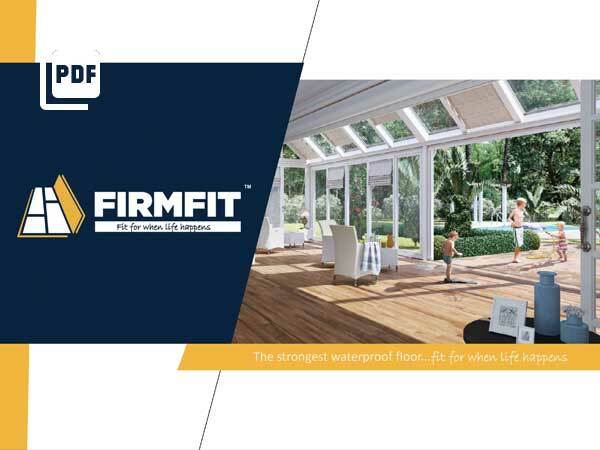 Firmfit – The strongest waterproof floor with the following features: Stable to sunlight, impact resistant, anti-bacterial, pet proof, easy-to-install, sound absorbent and 100% recyclable. 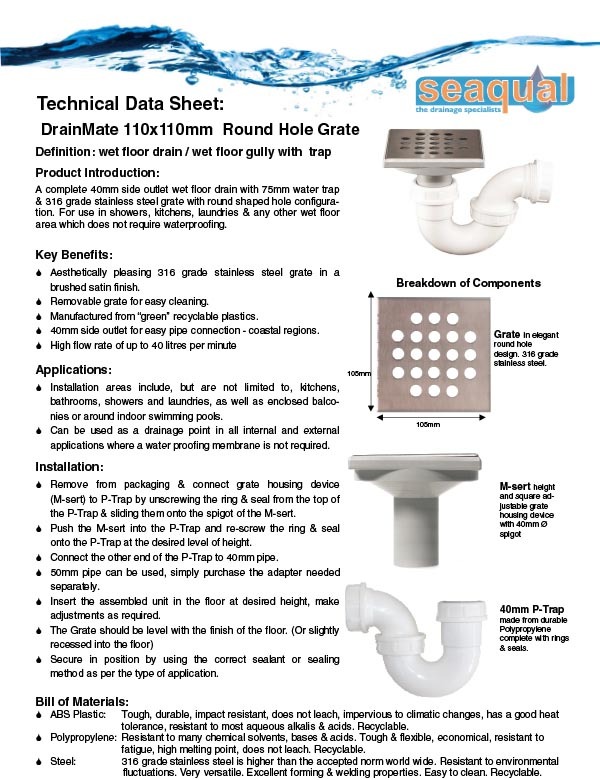 A complete 40mm side outlet wet floor square shaped hole configuration.For use in showers, kitchens, laundries & any other wet floor area which does not require a waterproofing membrane. 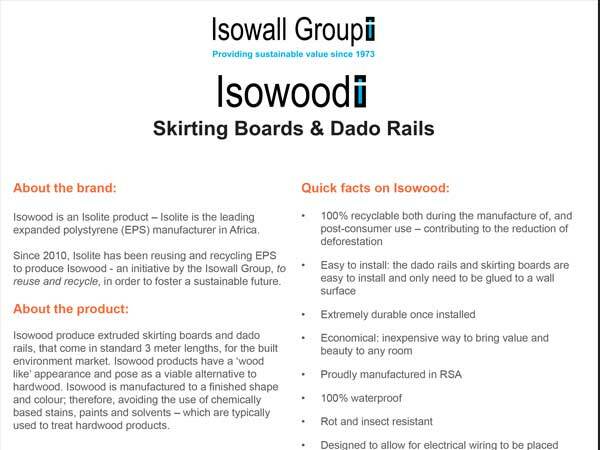 Isowood is an Isolite product – Isolite is the leading expanded polystyrene (EPS) manufacturer in Africa. 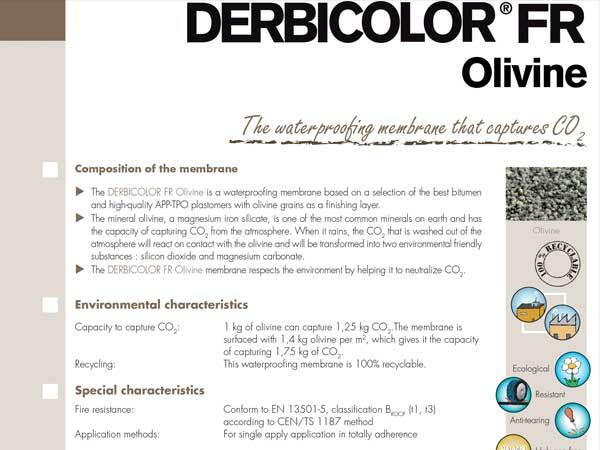 Derbicolor FR Olivine is a high quality waterproofing membrane with a top layer in olivine granulates. 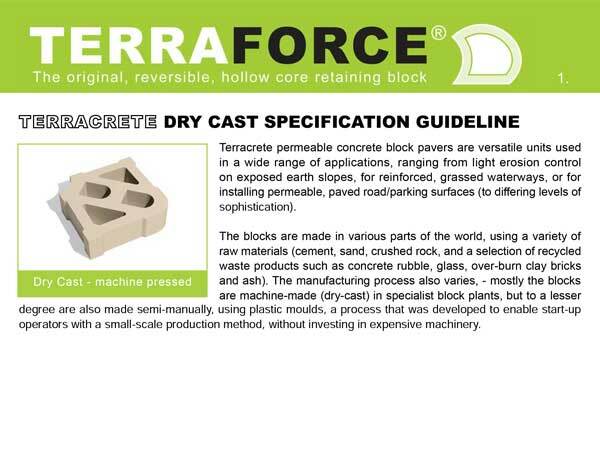 Just like the DERBIT membranes it is very durable and is 100% recyclable. 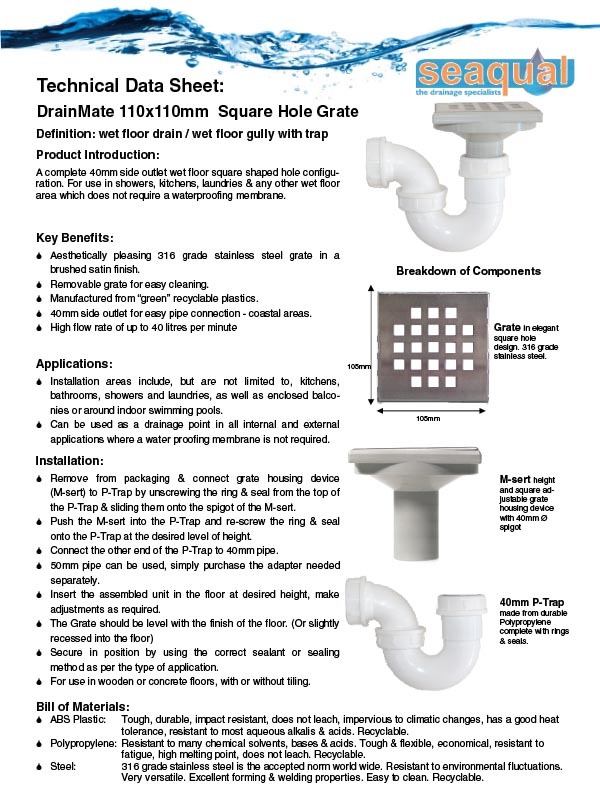 A complete 50mm side outlet wet floor drain with non-integrated 51mm water trap & 316 grade stainless steel grate with square shaped hole configuration for use in showers, kitchens, laundries & any other wet floor area. 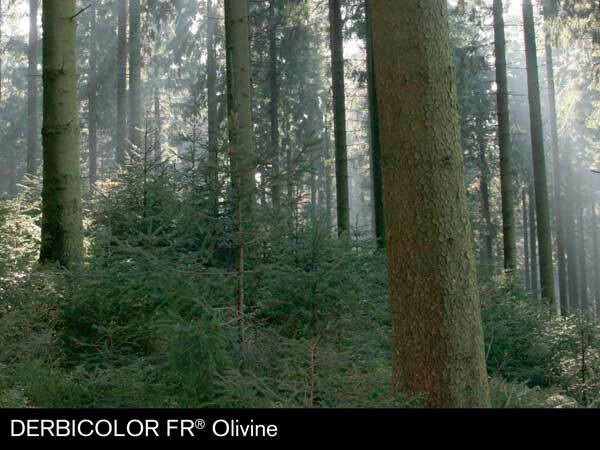 The DERBICOLOR FR Olivine is a waterproofing membrane based on a selection of the best bitumen and high-quality APP-TPO plastomers with olivine grains as a finishing layer. 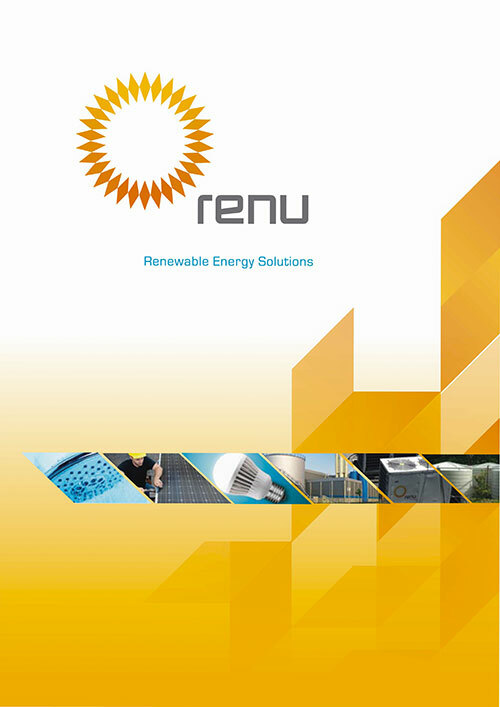 Renu specialises in commercial, industrial and residential renewable energy solutions. 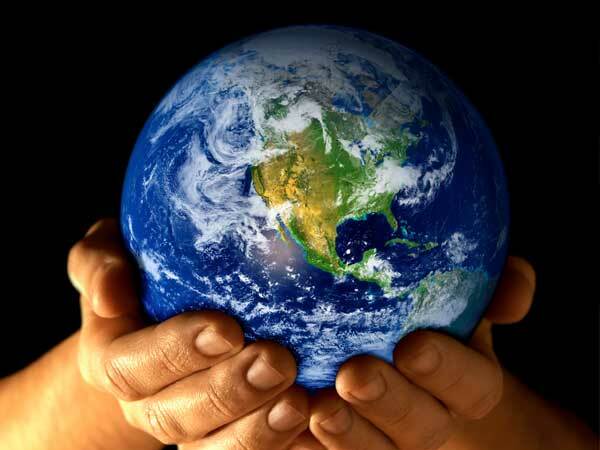 This includes energy efficient lighting, heat pumps, water harvesting, solar water heating and solar power. 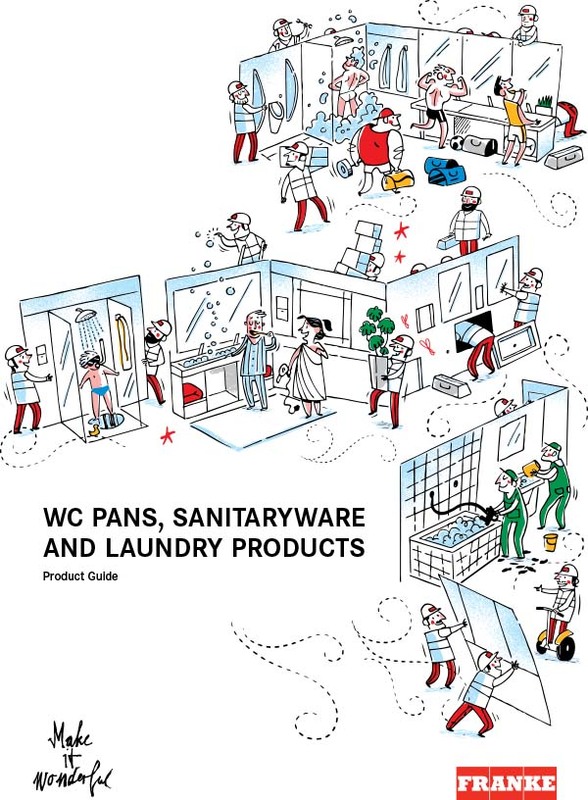 Renu has access to all the latest technologies and products which allows them to design solutions to cater for all situations. 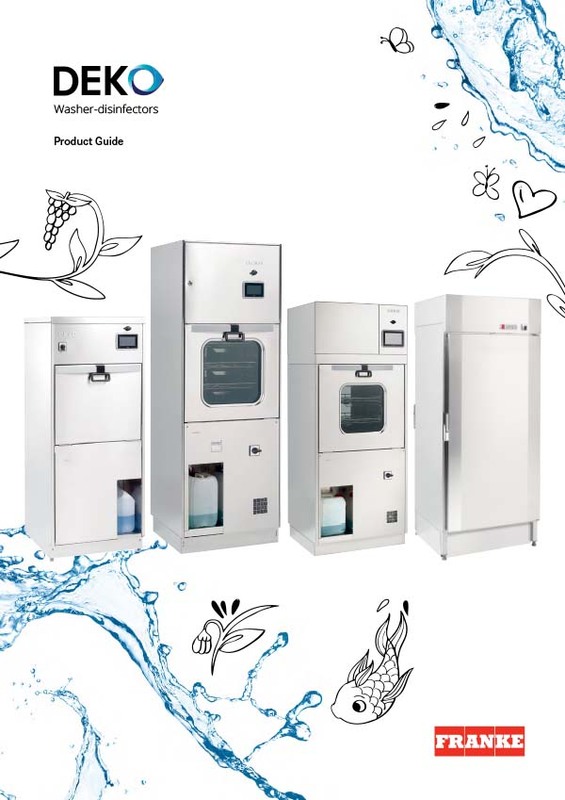 Energy and water consumption, location and budget all play a part in designing systems that provide the right solutions, which is why Renu offers a wide range of renewable energy products. 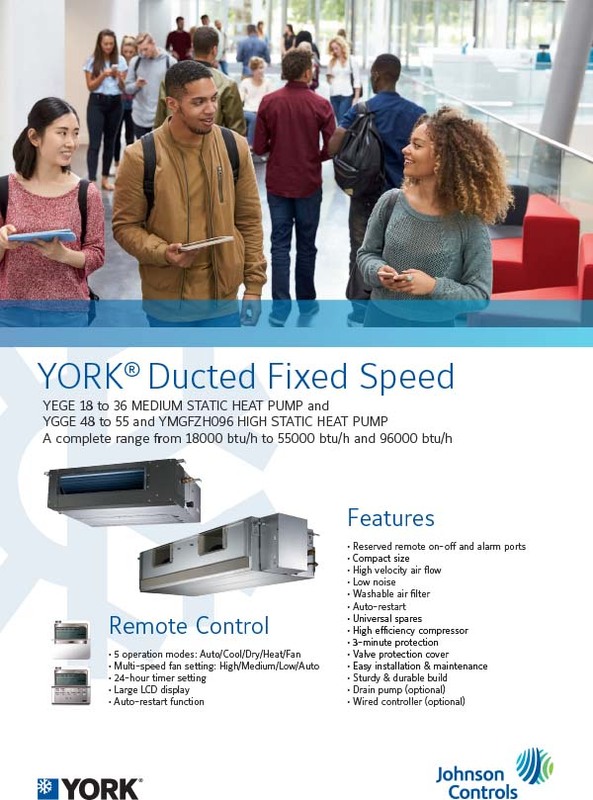 The VitylDrain 2nd Fix Pack is installed during the “finishing” phase of construction. 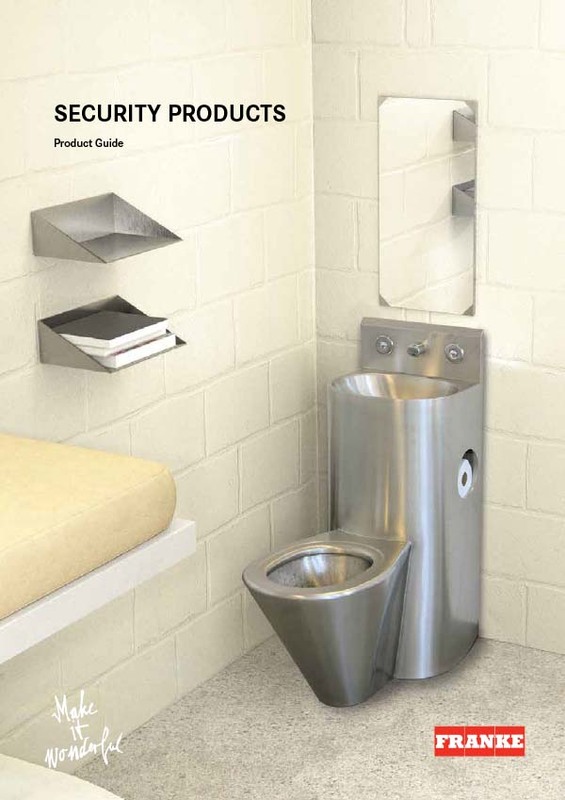 It comprises a large waterproofing flange, a vityl screw down insert & an ABS plastic grate. 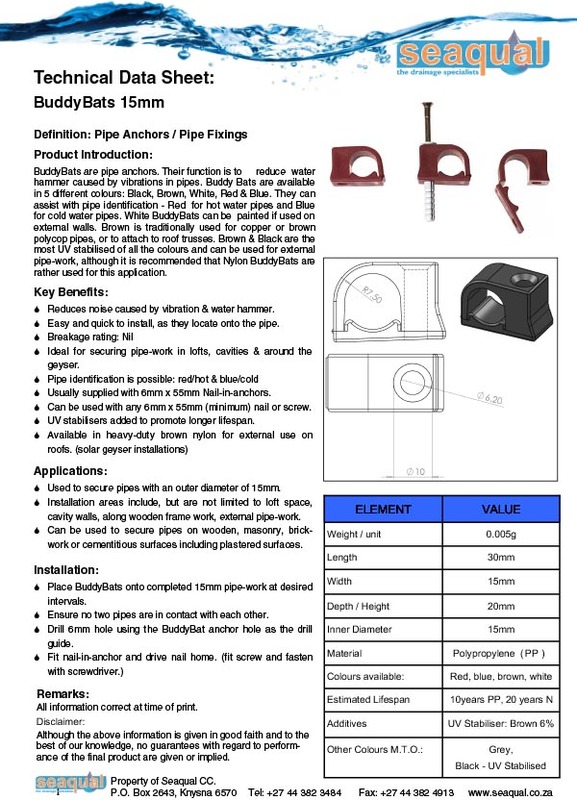 This product needs to be specified together with a VitylDrain 1st fix in order to make up a complete drainage unit. This is only the top half of a floor drain. 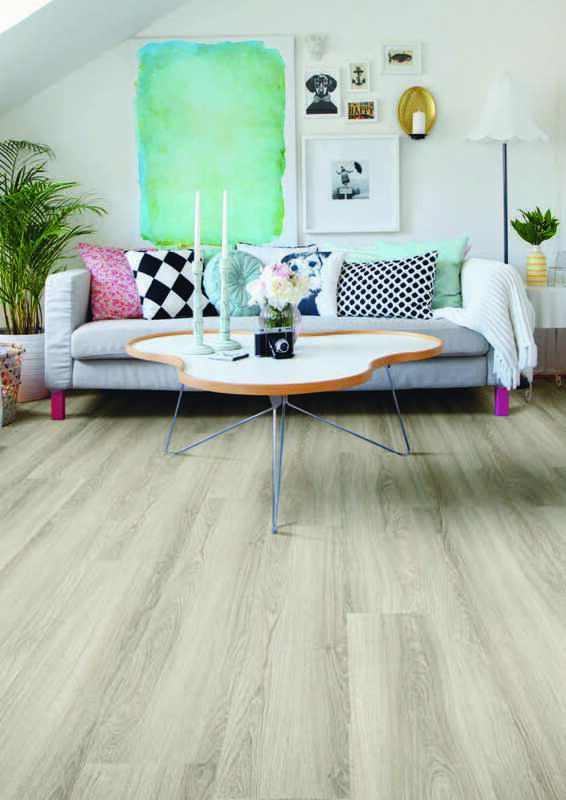 The Vinyl flooring adheres directly onto the waterproofing flange to create a permanent water seal. 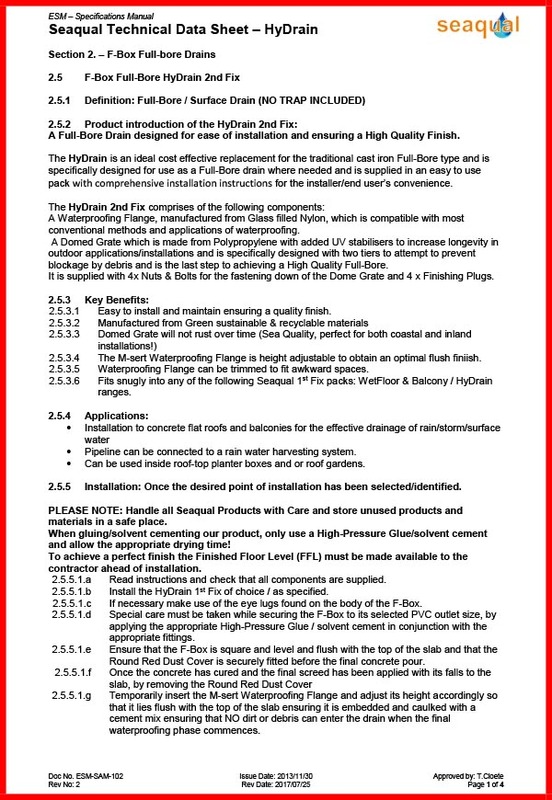 VitylDrain 2nd Fix is only compatible with VitylDrain 1st fix and must not be used with any other Seaqual 1st fix pack. 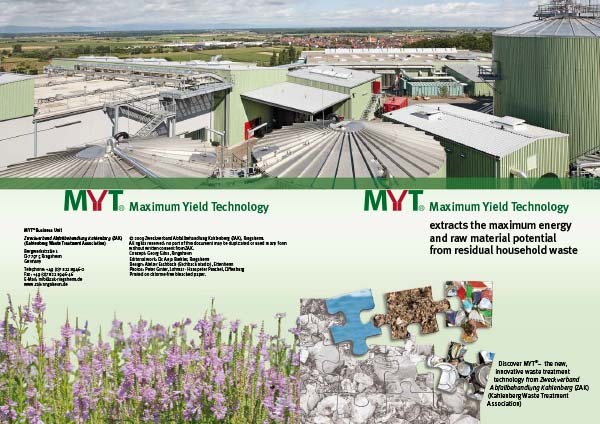 Maximum Yield Technology is a new, innovative process for treatment and utilisation of residual household waste. 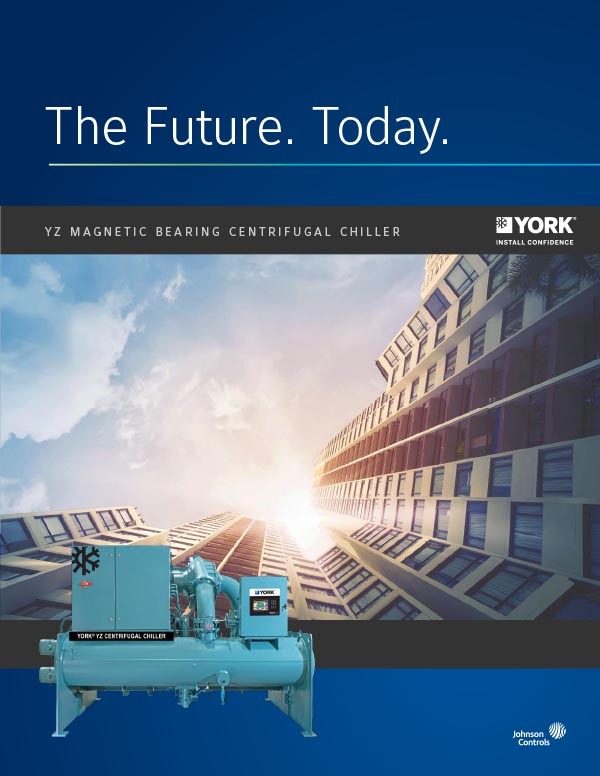 MYT® aims to extract the complete raw material and energy content of waste and to use the energy potential as recyclable sources of energy. 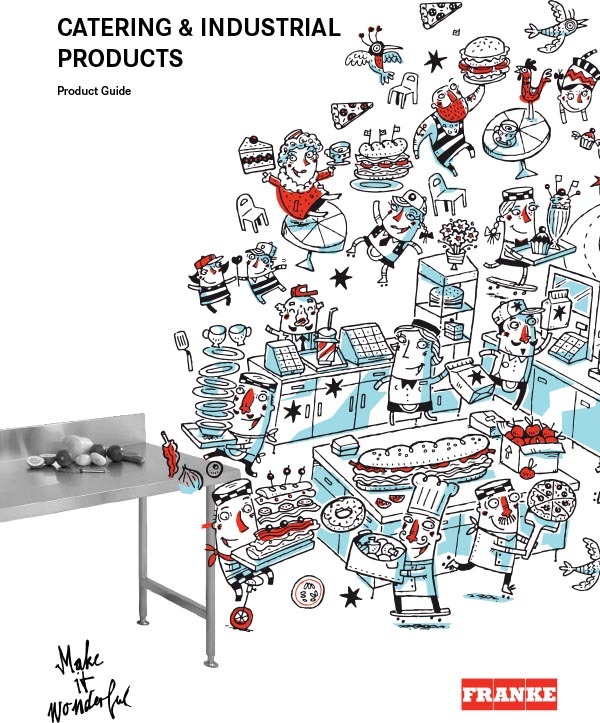 Instead of landfill or incineration solutions, there is now the option of optimum economic exploitation of waste in the form of raw materials, quality-assured fuels and energy-rich biogas. While most waterproof flooring available are not warranted for installation in rooms with large windows & a lot of sunlight, FIRMFIT is! 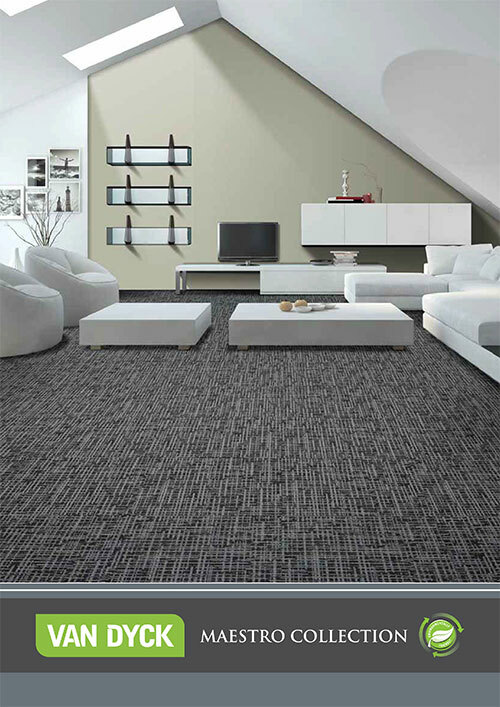 Floor features outstanding stability & strength.